Bacterial cells are surrounded by a highly cross-linked cell wall that has to be constantly broken down and remade as the cells get bigger. Since most bacteria reproduce by dividing the cell into two they also have to build a new bit of cell wall in the middle of the cell to make two daughter cells. In bacteria the FtsZ protein forms a Z ring to mark this site of cell division and all the other cell division proteins assemble on this Z ring and remodel the cell wall. Despite this, it has been known for a long time that some bacteria can exist as L forms which have lost their cell wall. 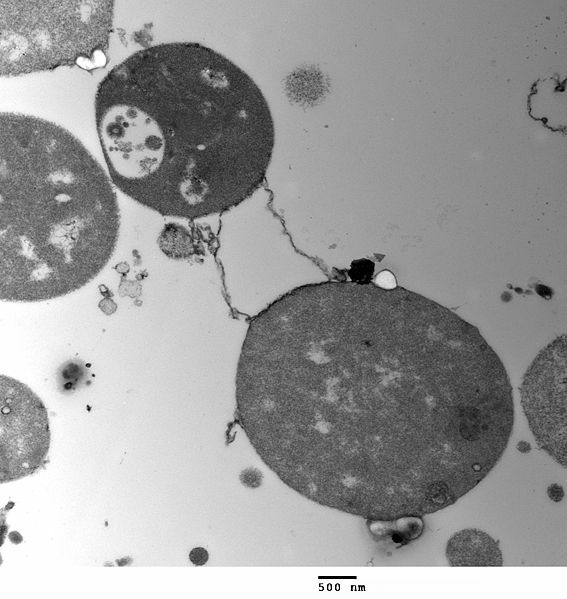 Even more amazing, these L-form bacteria don’t need FtsZ to divide and instead they just bud off membrane vesicles, some of which contain DNA and enough proteins to form a new cell. Jeff Errington’s group in Newcastle recently made stable L forms of a bacterium called Bacillus subtilis, effectively reversing 3 billion years of evolution . These bacteria can live without a wall or FtsZ but they still need a cell membrane to contain the cell contents and in another groundbreaking paper Jeff’s group have shown that simply increasing the amount of membrane the cell makes is enough to make these L-forms divide. The beauty of these L forms is that they help us to understand how the first living cells, reproduced themselves around 4 billion years ago. In the absence of a cell wall and a complicated cell division machinery they simply increased their surface area to volume ratio in order to propagate. And that, frankly, is amazing. Mercier R, Kawai Y and Errington J (2013). Excess membrane synthesis drives a primitive mode of cell proliferation. Cell 152 997-1007. Does Jeff Errington have any videos of the budding happening? I think there some movies in the suppl info for this paper and definitely for some of the previous L form papers from Jeff’s lab.